We present a dynamic simulation framework for topologychanging deformable objects. The objects are represented using tetrahedral meshes and deformations are governed by a corotational finite element approach for linear elasticityand plasticity. Geometric constraints are employed to efficiently handle topology changes in a unified way. 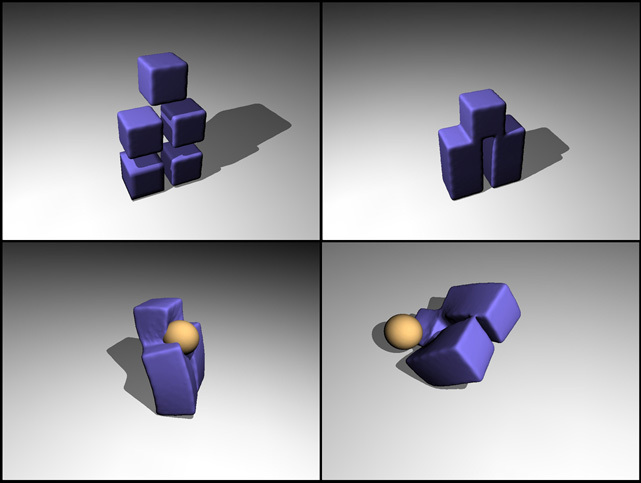 Topology changes comprise fracturing and merging of deformable objects. Fracturing is realized by breaking existing constraints, while merging is implemented by generating new constraints. Thus, geometric constraints significantly reduce the complexity of data structure updates in the context of topology changes. This improves the computational efficiency and reduces the implementation effort. Experiments illustrate the versatility and the efficiency of our approach. A hand leaves an imprint on a plastically deformable plate. Resting positions after elastic (left) and plastic (right) deformation of a bunny�s ears. A set of blocks merges and is then overthrown by a ball. Topology changes: An arm is removed from a teddy.